The Outer Banks History Center at Roanoke Island Festival is a treasure trove of Outer Banks information, dating back centuries and serving as an instrumental tool for historians, scientists, journalists, writers, educators, and the everyday public. Researchers and visitors who take a tour through their extensive achieves will be overwhelmed with the raw materials at hand, and it would literally take years to sift through all the documents and accounts available. Luckily, a passing visitor doesn't have to wade through the files to enjoy what the Outer Banks History Center has to offer. With friendly staff on hand to help researchers, and rotating exhibits that highlight some of the Outer Banks' most remarkable historical accounts, the Outer Banks History Center is a fun and educational attraction for visitors of all interests. Delve into the world of the Outer Banks, past and present, and make a stop by the history center a must on your next trip to Manteo or Roanoke Island Festival Park. The Outer Banks History Center is a regional archive and research library that is almost exclusively centered around the Outer Banks and the eastern North Carolina coastline, and is administered and managed by the State Archives of North Carolina. Within the walls of the expansive but unimposing building, researchers and historians will find nearly 300,000 individual items, including manuscripts, books, photographs and negatives, periodicals, maps, newspapers and public records, oral histories, audio and video recordings, and even original works of art. Obviously, with such a collection, a range of topics are covered in depth from first-person and / or time-period specific accounts, and the subject matter varies widely from historical, cultural, and economic accounts to scientific and governmental topics. While certainly all aspects of the Outer Banks and coastal North Carolina's history can be found at the center, certain topics which are specific to the region are covered in great detail, both for their prominence as local historical events, and as instrumental additions and aspects of the Outer Banks' culture. The Outer Banks History Center is one of the best resources for a variety of topics, including Elizabethan era history and culture, as well as early European exploration. 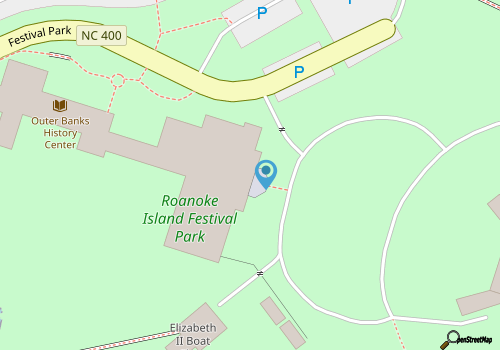 Remember that Roanoke Island was the first English settlement in present day America, and as such, the center has rich materials on the effects this initial settlement had on the development of the rest of the country. Current history center treasures of this period include copies of the published writings of Richard Hakluyt and John Smith, copies of the watercolors of John White, and an important map collection that ranges from the 16th century to modern navigational charts. Researchers can dig even deeper and explore the roots of the islands' first Native American residents, with a wealth of materials and artifacts dating back to these early locals. Sift through recent archeological reports and works chronicling the accounts of the explorers' first encounters with the Native Americans, and get an up-close look at the life of the region's first locals. Local African American history is also well-preserved and documented, with a number of materials dedicated to the Freedmen's Colony on Roanoke Island, a freed slave colony that was home to approximately 2,000 escaped slaves during the height of the Civil War. Though lasting just a few short years, these refugees built a strong and thriving community in the heart of Manteo, and the history center documents their progress and lifestyle, as well as their significance to period sociologists. Visitors can also learn about the Pea Island Lifesaving Station crew, the first all-African American lifesaving crew in the Life Saving Service, and a model team for crews all along the coastline. Military history is also covered in great detail at the Outer Banks History Center, as the Outer Banks region played small but crucial roles in the Civil War, World War I and World War II. Several of the first battles of the Civil War were fought on Outer Banks soil, (or rather sand), and researches will find a collection of maps, official reports, original documents and letters, original drawings, newspapers, period etchings, and illustrations which document the Hatters Island and Roanoke battles. During World War I and World War II, the coastal region off the Outer Banks was a hotbed of activity as German U-Boat submarines snaked along the coastline, just miles offshore. A number of British tankers were destroyed during coastal skirmishes, and dozens of shipwrecks were recorded off the Outer Banks during the deadly war years. Relics from this tumultuous time period include photographs, memoirs, and histories of actions taken by the British, Americans, and the U.S. Coast Guard in an effort to save the destroyed ships and stranded crews. Shipwrecks in general, as well as lighthouse and US Life Saving Service stations and operations, are also found in abundance at the Outer Banks History Center, as the area was home to seven of the original life saving stations, including the most decorated station of all time, the Chicamacomico Lifesaving Station in present day Rodanthe. Researchers can trace the construction of the local lighthouses through copies of architectural drawings, or can browse through a premier collection of shipwreck history which includes several thousand wreck reports, telegrams, and other documents from the life saving station's heyday of 1883-1933. Outer Banks locals or visitors with OBX based family roots will also find an impressive section devoted to genealogy and family history. With family files, donated photographs, published family histories, and public records including deeds and marriage certificates, locals from Dare, Currituck, Hyde and Tyrrell counties can trace their regional roots through both public recordings and personal accounts. Scientists will want to explore the history center's extensive collection devoted to natural history and environmental sciences which explores the persistent change of the natural landscape, and the influence of man on the Outer Banks' environment. Specialties include terrestrial and marine biology, botany, geology, geography, oceanography, and meteorology, and even staff from the Weather Channel has used the Outer Banks History Center as a resource for understanding more about the weather and natural environment of the barrier island coastline. Essentially researches of all interests will find a collection or subject within the 300,0000 materials that peek their interest, and anyone with a love of local environmental studies, Elizabethan era culture, maritime history, or a wealth of other topics will happily hunker down and browse through the history center's materials. The center responds to up to 4,000 requests annually to review specific aspects of their collections, even from famed national organizations like National Public Radio and the History Channel, and many locals are proud of the fact that this large collection is comprised, categorized, and wide open for the public's enjoyment. While casual visitors may not want to reserve a desk at the research library for the afternoon, they can still enjoy the highlights of what the Outer Banks History Center has to offer. 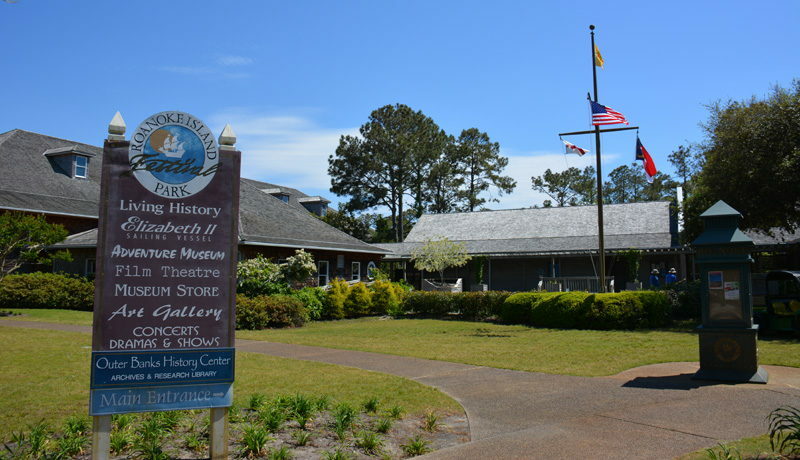 The center has a wide ranging series of exhibits in its extensive entrance and lobby, known as the Outer Banks History Center Gallery, and visitors to Roanoke Island Festival Park are welcome to wander through and discover some of the Outer Banks' most prominent, interesting or surprising roles in history and modern culture. These exhibits change regularly, generally every year or so, which means that every annual visit will present a new display of artifacts, documents, and other aspects of a unique slice of the Outer Banks' past and present. Recent exhibits include an extensive collection documenting Bruce Roberts' 50-year career as a photojournalist who exclusively captured shots of North Carolina. Working for most of those years at North Carolina's own Our State magazine, the collection included images of history's greats, like Elvis and Joe DiMaggio, as well as incredible shots of some of the state's and the Outer Banks' most scenic locales. In 2011, the Outer Banks History Center did a year-long exhibit on the Bodie Island lighthouse, just in time for the beginning of the most "recent" lighthouse's extensive renovation project. This exhibit chronicled the history of the three 1800s towers that were constructed, (as well as the failure of two of these structures), and included photographs, architectural drawings, and artifacts from the lighthouse keepers' daily routines. The most recent exhibit to grace the halls of the history center was a study of Roanoke Island's role in the Civil War. This remarkable display outlined how the small fishing town of Roanoke Island became an essential battleground early on in the war, and may have helped turn the tide to the Union's favor. Letters, newspapers, and period artwork put a personal spin on the story, which is little-known by even the most enthusiastic history buffs. In essence, no matter when you make a trip to the Outer Banks History Center, chances are you'll encounter a new slice of Outer Banks history that is somewhat forgotten on a national scale, but is nevertheless an enthralling and essential part of the Outer Banks' legacy. Visitors who want to explore the Outer Banks History Center can do so at any time via the Roanoke Island Festival Park entrance, located on the edge of Downtown Manteo, and bordered by Shallowbag Bay. The Outer Banks History Center is open daily year-round, from 9:00 a.m. to 5:00 p.m., and is also open on most holidays. The reading room at the Outer Banks History Center generally follows a similar schedule, and is open Monday through Friday, 9:00 a.m. to 5:00 p.m. The reading room includes a number of desks and chairs for extensive research, public computers, a microfilm reader-printer, photocopier, and access to audiovisual equipment. A team of archivists are also available during hours of operation to provide visitors with assistance finding materials, and also to retrieve additional materials from the "stack room," where a large number of the center's 300,000 piece collection is located. Journalists and researches who may require copies or reproductions can also request these materials in person at the Outer Banks History Center, as all of these materials can be copied in house. A small fee is required for this service, and some materials may not be copied due to donor request or preservation concerns. The helpful research staff will be happy to direct patrons on this issue, as well as find additional materials on their subject matter of choice that can be copied. Researchers who would like to access the extensive Outer Banks History Center's library but do not have an upcoming Roanoke Island trip planned will also find many of the materials available online through the MARS (Manuscripts and Archives Reference System) catalog. These materials can include publications, newspapers, books and even photographs, and web browsers will also find a number of search tools to see what other materials can be found in-person at the center on a range of topics. The Outer Banks History Center also offers a variety of seasonal educational programs and fun events, sponsored by the Friends of the Outer Banks History Center and other regional and national groups. From guest speakers who unravel the mysteries of the Lost Colony or shed new light on the region's role in the Civil War, to dance classes that teach visitors how to learn the moves of the 1920s OBX locals, the range of subjects and structure varies widely. Keep your eye out for the Roanoke Island Festival Park's calendar of events for upcoming sessions or programs in your favorite Outer Banks area of interest. Clearly, whether you pop in for a quick visit en route to the Roanoke Island Festival Park attractions, or stay for an afternoon flipping through old newspapers and photographs, the Outer Banks History Center has an endless supply of material to cover. Check out their website catalogs online at http://mars.archives.ncdcr.gov/BasicSearch.aspx, or simply stop by and talk to an archivist, and see what Outer Banks mysteries you can uncover during your visit. Researches, historians, writers, or anyone with a local curiosity can call or email the center as well for more information on materials available on a particular subject matter. Often, this initial contact can be an effective first step on plotting your research, and can serve as an introduction to the materials the Outer Banks History Center has on hand. Outer Banks History Center fans can easily become valued supporters by joining the Friends of the Outer Banks History Center. Funds provided by the membership fee are used to purchase valuable documents and materials to add to their collection, as well as provide outreach and promotional programs to the public. Members also receive a quarterly newsletter, discounts on books and prints, and regular emails of upcoming events at the center. Visitors on or off the Outer Banks can get an inside glimpse at the Outer Banks History Center's collection by visiting their extensive Flickr page, http://www.flickr.com/photos/obhc/, which chronicles decades of local history via hundreds of archival photos and videos. The photo gallery is essentially a first-hand look at the development of the Outer Banks as the popular vacation destination it is today, and is a memorable step back in time for long-time visitors and newcomers alike. The Outer Banks History Center's Facebook Page, https://www.facebook.com/pages/Outer-Banks-History-Center/178414201526, is also a great way to stay connected, and also be in the know on upcoming events, programs, and special sessions featured at the history center. The center also announces new materials as they come in, as well as any holiday or serve weather related closings. Visitors who make a special trip to the Outer Banks History Center should plan on spending a day in Manteo exploring all the other historical attractions, including the Fort Raleigh National Historic Site, where the settlers first set up their colony, the Elizabethan Gardens, and the expansive Roanoke Island Festival Park, an interactive look into Roanoke Island circa 1585. With miles of historic terrain to explore, and a fantastic collection of shops, galleries and restaurants, Roanoke Island is a worthy day trip exploration for any visitor. 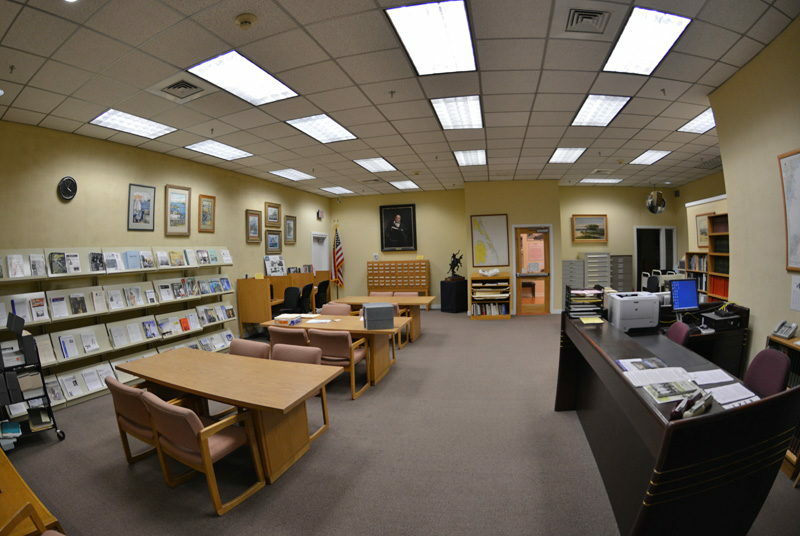 With hundreds of thousands of documents and materials dating back hundreds of years, it's not surprising that the Outer Banks History Center is considered one of the most extensive and informative research libraries in the state. Thousands of writers, journalists, scientists, historians, and curios community members visit the center on a regular basis to find new and undiscovered accounts of some of our national history's most significant events. Whether you want to trace your own Outer Banks family roots to their earliest beginnings, or simply want a first-hand perspective on the myriad of events that helped shape the region and the country, the Outer Banks History Center is an unparalleled resource to discovering the fascinating, stormy, and always enthralling history of the Carolina coast. 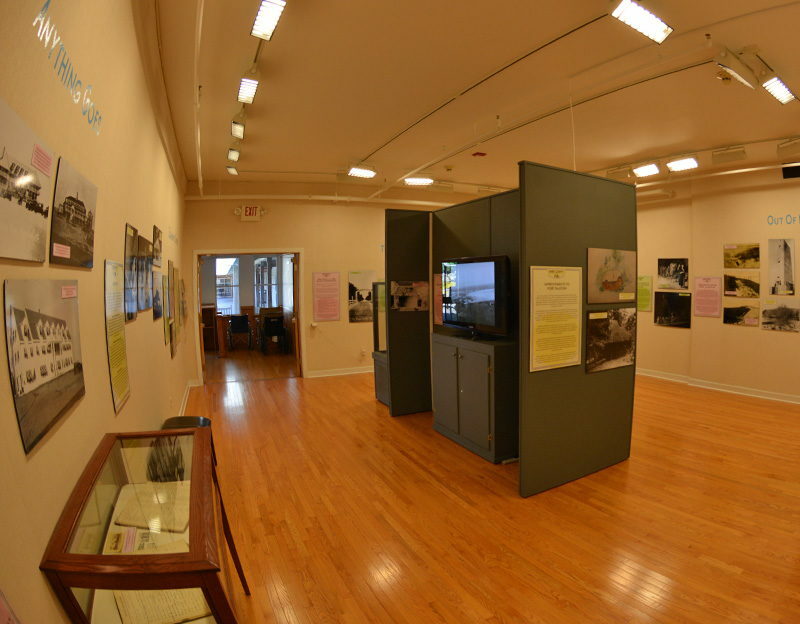 Wander through the rotating exhibits in the gallery, or pull up a chair and start leafing through historical records - with so much material to sort through and to discover, the Outer Banks History Center can easily keep an interested visitor fully immersed in the OBX culture for years and years. Call 252-473-2655 for current hours.